This UK round-up of Google Maps Mashups was compiled with the extensive help of Mapperz. Mapperz has just been named as one of Off the Map's Top 25 Blogs in GIS, GeoWeb and Cartography (Google Maps Mania gets a little mention as well). The sheer number of maps in this round-up is partly due to the fact that Google Maps has been adopted by most of the mainstream media in the UK. Hence this compilation of UK maps includes examples by ITV and Channel 4 (two of the main television companies in the UK) and The Times newspaper. This map from Channel 4 really is big and it contains a lot of British food. 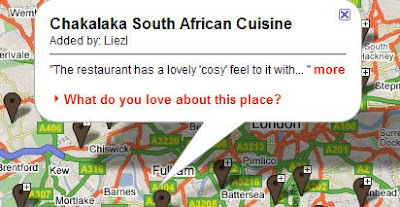 The map tags thousands of food outlets in the UK with readers' reviews. It is possible to search the map by food type (restaurants, cafes, fishmongers, greengrocers etc, etc) or by mood (healthy, posh, traditional etc, etc). Each of the tagged results includes the address of the establishment and readers' reviews. If you disagree with a review you can add your own comments and you can even submit photographs. The sheer number of tagged outlets and the number of reviews on offer make this a great resource for food lovers in the UK. ITV News is working with the Royal Institution of Chartered Surveyors to conduct a nationwide, year long survey of house prices, tracking the changing market month by month. To help present their findings they have created a Google Map of some of their interviews. Houses throughout the UK are tagged on the map. Clicking on the house tags reveals the Royal Institution of Chartered Surveyors valuation of the house and a link is provided that loads an interview with the house's owner(s). Warning: Clicking on the video links in Firefox caused my browser to crash, clicking on the video links in Chrome caused my browser to do nothing, i.e. not load any videos. The videos only played for me in IE. These two maps created by Journalism.co.uk maps the locations of freelance journalists / photographers who sign up to Journalism.co.uk's freelance directory. The maps are designed so that potential employers and commissioners can locate journalists and photographers in their part of the world. Freelancers can also use the map to find other journalists / photographers who are working in their region, giving them the chance to build new contacts. The Times newspaper has put together a map of 200 hotel and day spa reviews. Each tagged spa on the map contains the spa's address and a link to The Times Travel section's review of the spa. Stuart Leech's photographic project for his photography degree uses Google Maps to explore the British postcode system. Stuart used Google Maps to pinpoint the centre of the first district of each postcode area across the south of England (45 in total) and photographed the specific location. Naturally he then created a Google Map of the 45 photographs. This Google Map will help you find log cabins to rent in the UK. Each of the mapped cabin's comes with a description and a link to the cabin's website. You can therefore use the map to find your dream holiday home and book your vacation. Safelinks is a website tracking crime in the North and North East Lincolnshire area. Safelinks have produced a number of Google Maps tagging the crime's reported in Grimsby and Scunthorpe. Each tag on the map shows the date the crime was committed and a brief description of the crime. Plots the location of thousands of Scottish cities, towns, villages and hamlets. For each location census and Wikipedia data is presented. Visitors can even add their own place reviews, pictures and map points. MyTransport Maps is a project by Northumbria University. The map allows users to set up routes of hikes, bike rides etc and create way points along the route. It is possible to attach media to the routes as well, such as images, sound and /or video. Anyone can view the created routes but you do have to be a student or member of staff at the university to add your own. My Neighbourhoods is a social networking site with a difference - it is designed to create social networks in your neighbourhood and local community. To use the map you enter your postcode and My Neighbourhoods returns a Google Map with property sales, jobs, reviews of businesses and other users in your area. The historical maps are available as an option at the top right of the map alongside the normal Google Maps' 'map', 'hybrid' and 'terrain' views. If you choose the historical view the different maps are loaded at different zoom levels (my guess being the closer the zoom the more modern the map loaded).